A boat is, at its very core, a set of tradeoffs — like most anything worth having. You can go fast, or you can go far. You can have comfort, or you can have style. And so forth. Dang, why can’t it be simpler? Well, it may have just gotten so. If exploring remote anchorages in Mexico or Alaska on a trawler is what you seek long term, but meanwhile you want to get to Catalina in under two hours from Los Angeles on a stylish planing hull, the answer may be an Italian trawler called the Azimut Magellano 53. The name was no accident. The Portuguese explorer Ferdinand Magellan, renowned for his near-circumnavigation of the globe, was the inspiration for this head-turning Italian line of cruisers. The boat is billed as a “hybrid,” and like a Prius it will deliver good performance with surprising fuel economy. Unlike a Prius, the Magellano is a hottie that will stand out in an anchorage — and that’s even before anyone comes aboard. 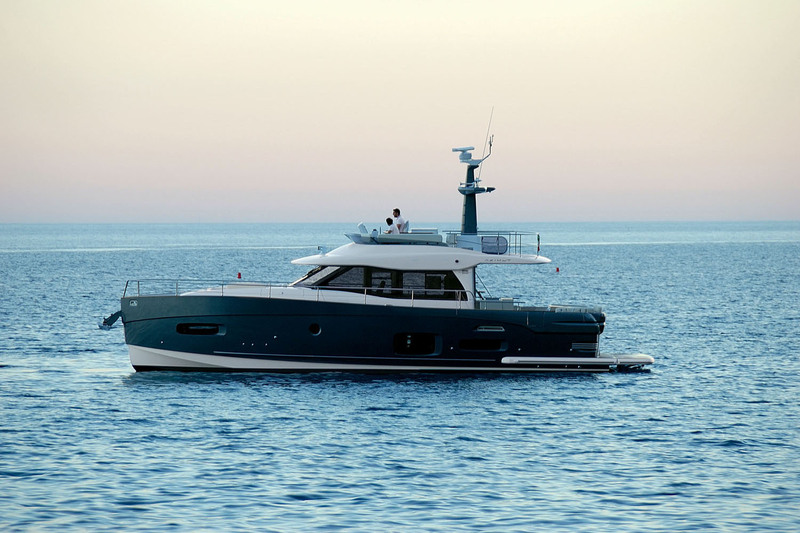 The reason the Magellano 53 can offer a balance of speed and respectable fuel consumption is because of its “dual mode” hull, which was drawn by naval architect Bill Dixon. Imagine a semi-displacement hull forward, with a deep V that parts the waves, transitioning to flatter aft sections with a chine that allows it to plane. A 17-degree deadrise amidships transitions to eight degrees at the transom, giving the Magellano 53 a unique ability to cruise efficiently at 10 knots but also plane at 20 plus knots when it’s time to get going. Its profile is no less interesting. A full plumb bow gives it an aggressive demeanor while providing ample room for interior accommodations. The windshield sweeps back and is not vertical or angled forward like on traditional trawlers. 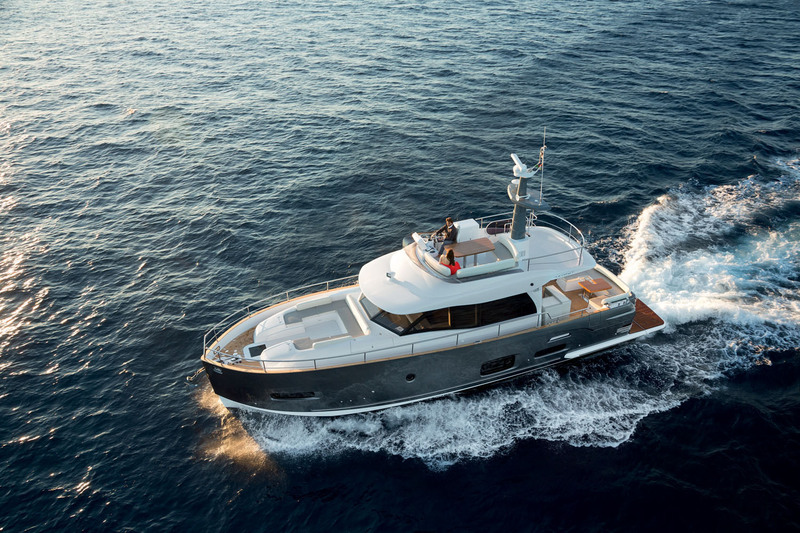 Finally, add both round and rectangular hull ports, and you have a contemporary non-trawler-looking trawler that may even appeal to boaters who are allergic to traditional trawler styling. This is sounding like a good set of tradeoffs. I stepped aboard via an enormous teak beach — a hydraulic swim platform that gained depth when the Magellano 50 was stretched to make the 53. Steps on starboard brought me up to a cockpit that also gained six square feet. Here, one side of the U-shaped transom seat lifts to reveal the new optional crew quarters with a bed, a head and a sink. 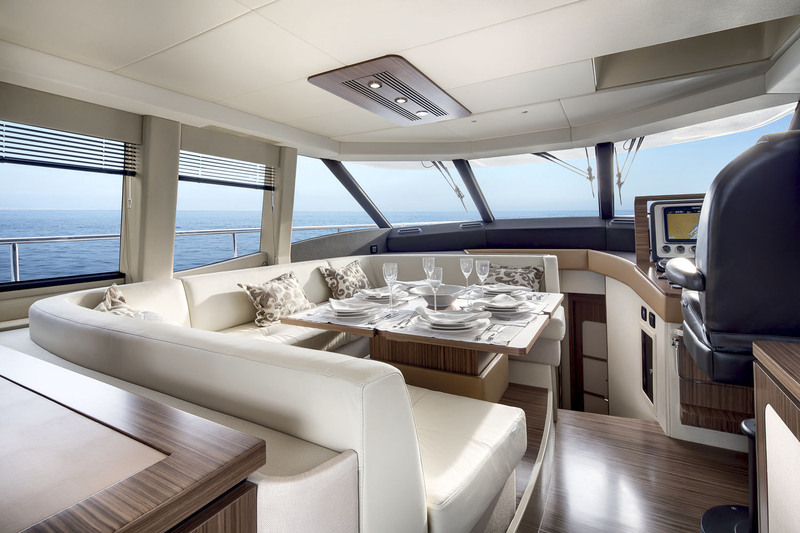 The transom seat is fronted by an optional folding teak table, and because there is a galley module with a grill, a refrigerator and a sink, this will be an excellent place for docktails or alfresco dining. An optional full canopy with pole supports on the swim platform is available for shade or rain protection. 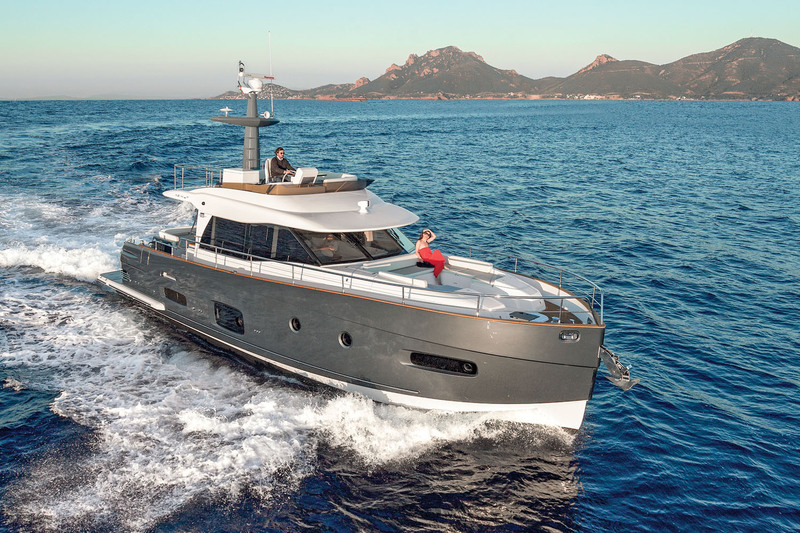 Steps, again on starboard, lead up to a flybridge with a U-shaped dinette to port; the helm opposite is tucked in front of another optional galley module with an ice-maker, a refrigerator and a grill. A small destroyer helm wheel adds to the “shippy” feel, as do the aesthetics of the composite tower aft, which holds various antennas including radar and satellite domes. There’s also a clever surprise in the form of a fixed standup shower incorporated into the tower. 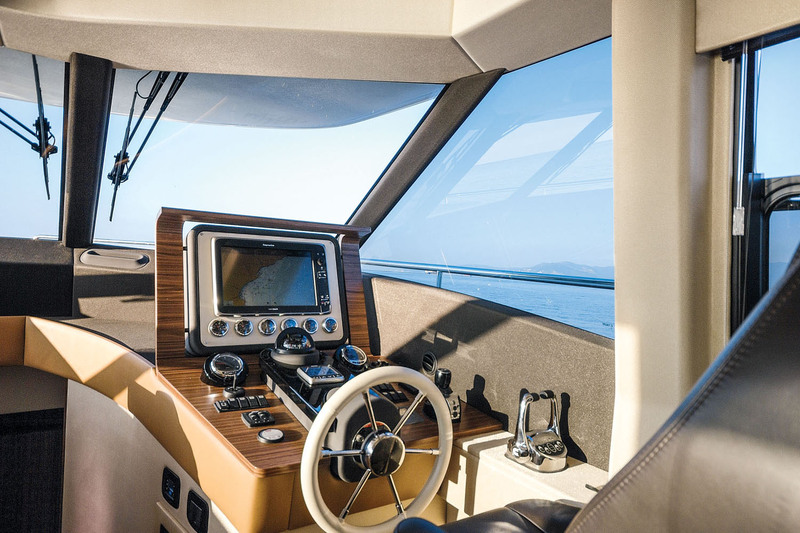 Visibility from the flybridge helm is good forward, and the driver can communicate with anyone working with the windlass or picking up a mooring on the bow. A backup camera helps, because the flybridge deck obscures sightlines aft. 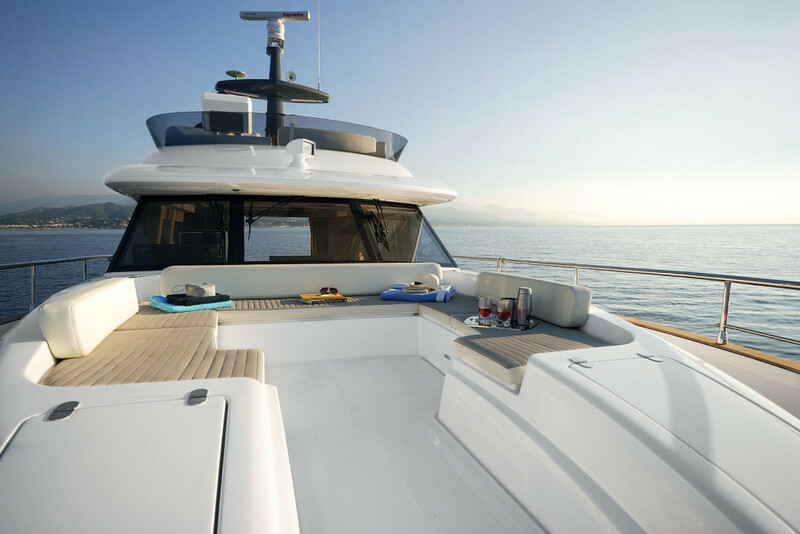 Because the whole superstructure is set farther aft, the foredeck is noteworthy. There is plenty of room to work on the bow with the Quick windlass, and there is an amazingly deep anchor locker with a good drop for the chain. 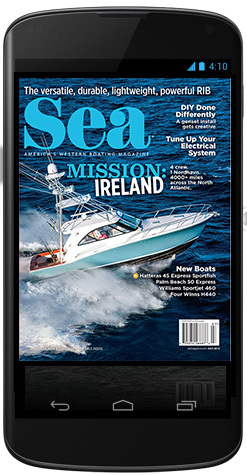 The only improvement would be to open the chocks, since closed round ones can be knuckle­scrapers when you’re trying to get a mooring or dockline through them and onto a cleat quickly. A notable feature of the foredeck is the lounge. It’s no basic sunpad but rather a full U-shaped settee that will accommodate 10 people for cocktail hour. Large boats usually have plenty of space, but it’s what you do with that space that matters. A good layout is about fitting in all the things that are necessary for efficient passagemaking and comfortable living aboard without wasting space. 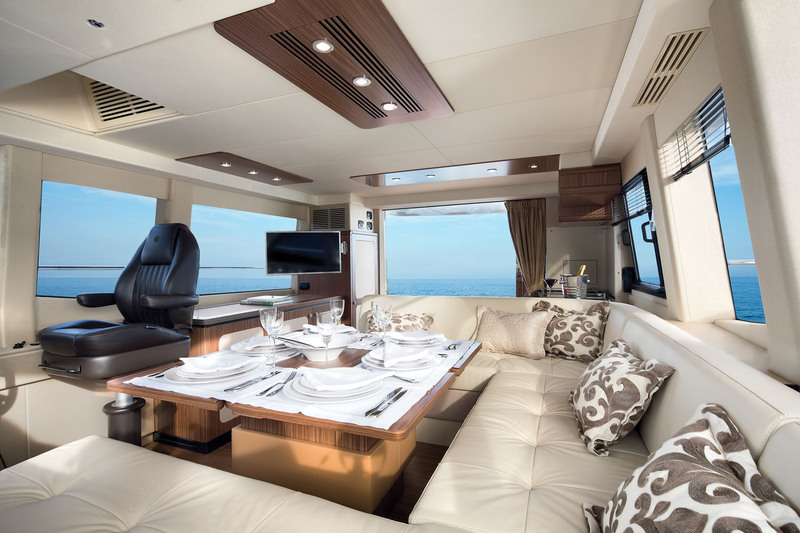 The Magellano 53 does a nice job of creating areas that work much like our shore-side lifestyle. The basics start on the main deck through an aft glass sliding door that opens wide to combine the outdoors with the interior. From here, there’s a clear view all the way up to and through the front windshield, and there are no level changes or toe-stubbers from the galley forward to the helm station. On the port side, the L-shaped galley is open to both the inside and outside dining areas. A sink, ceramic cooktop and microwave/convection oven nestle together for convenience, and the counter over the sink folds up to create a backsplash. The standup refrigerator is in a cabinet to starboard where a swing-out flat-screen TV can be mounted. The large U-shaped dinette to port can seat six easily and also serves as companion seating for the driver. The table can be kept compact, but it folds out to double in size when needed. 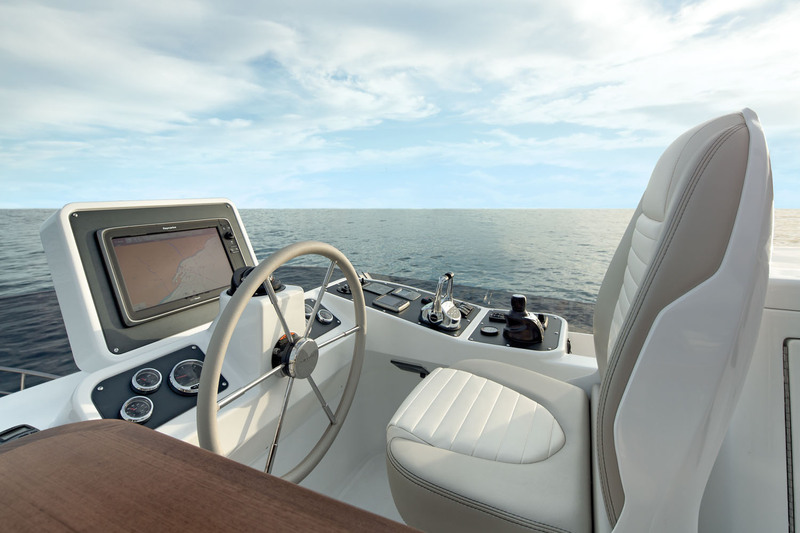 The helm is to starboard and has a single leather-wrapped captain’s chair, one Raymarine eSeries multifunction display, gauges, engine throttles and an opening side window for fresh air and easy communication with anyone on the dock or at the bow. The Xenta joystick that commands the engines and bow thruster in combination is outboard on the dash. Here, a smaller destroyer wheel subtly reminds one that this is a vessel designed, like ocean voyagers, to go far. The steps to the sleeping accommodations are angled slightly to create room for three cabins and two heads below. The VIP cabin is forward and is so nicely appointed it could serve as the owner’s suite. 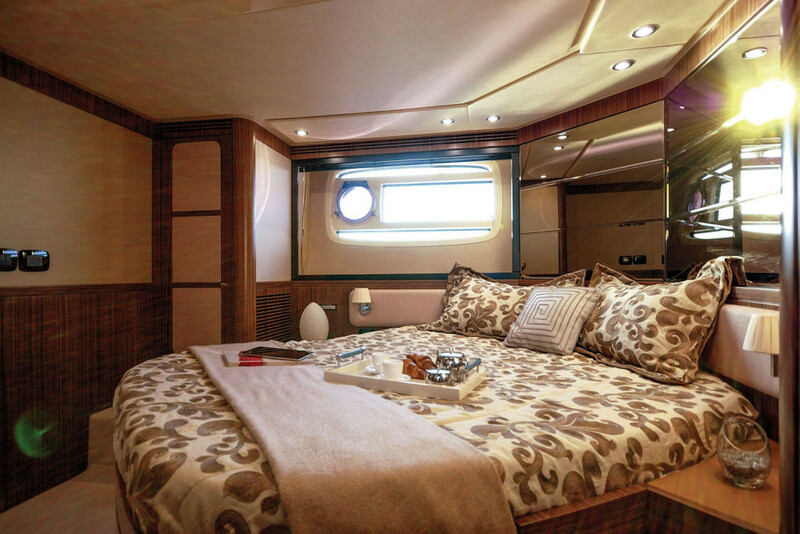 A center island berth has a “headboard” made of mirrors that reflect the light that comes in from two rectangular fixed ports on either side, two round opening ports for ventilation and the opening overhead hatch. The overall effect not only makes the cabin brighter, it makes it seem bigger. 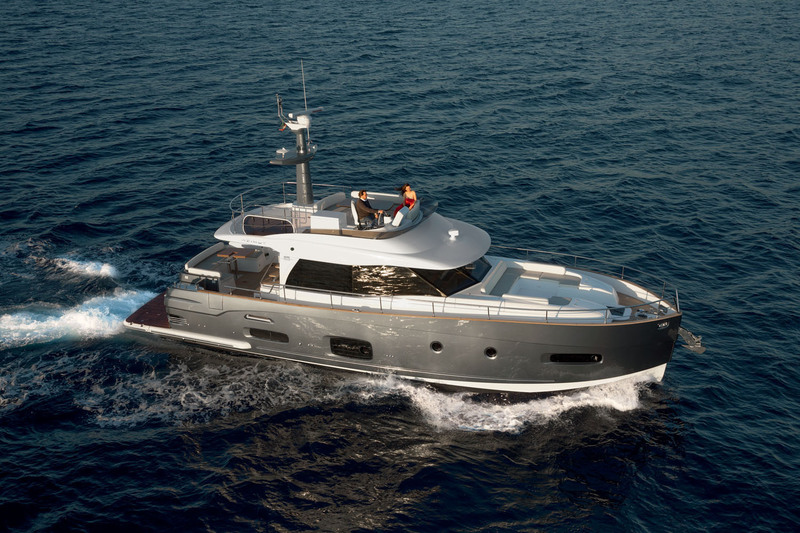 A private door on starboard opens to the head, which includes a round shower stall and doubles as the day head. It is shared with the third cabin to port, which has over/under bunks that will be great for occasional guests, kids or even storage. The foyer is neither cramped nor wasteful of space and includes a cabinet for a washer/dryer. 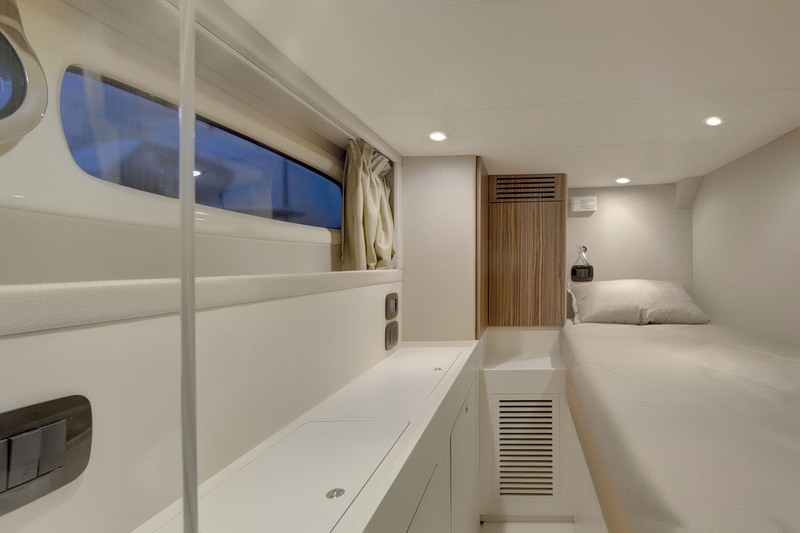 Aft is the master suite, whose head runs along the entire port side and includes a separate shower stall. Azimut changed the bed configuration by angling the headboard (also mirrored) aft and to starboard. And because the berth isn’t shoehorned in, owners can walk around it with room at the foot. Stowage below all the berths and large hanging lockers offer a place for everything. The Magellano 53 is powered by twin Cummins QSC 8.3L 500 hp diesels. The V-drive configuration allows the engines to be placed a bit farther aft in the hull, and though there is no pod drive option, the Xenta system allows for joystick control that makes it easy to dock, spin and generally have better control in tight quarters. A bow thruster is standard, and a stern thruster is optional. MarineMax is the sole distributor of the Magellano line in the Americas and takes responsibility for outfitting the boats for local markets. 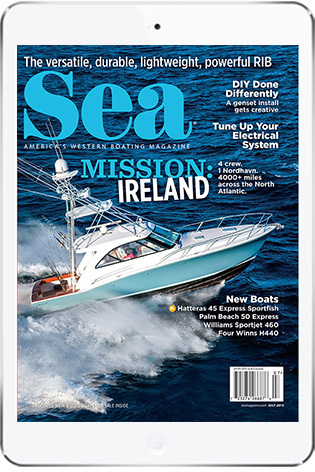 MarineMax San Diego chose to add a Seakeeper gyro stabilizer with every hull. It’s a $125,000 option that brings the total price to around $1.8 million but its effect can be significant, and it will be appreciated in rolling anchorages or for passage­making in long, quartering seas. Our test was on the flat waters of San Diego Bay. Peter Zaleski of MarineMax maneuvered the boat out expertly and we were on our way with all tanks (a total of 1,030 gallons) about a quarter full. Running with the breeze of about eight knots, we topped out at 23.3 knots at 2620 rpm at wide-open throttle. The most economical, but still respectable, speed was around 1400 rpm, where the Cummins engines burned 8.4 gph at 10 knots. With no reserve, that would be a 1,000 nautical mile range. Of course, sea conditions and wind will affect these numbers, so it’s best not to bank on absolutes, but clearly, this is a long-distance voyager designed for extended coastal cruising. Also, the transition to plane was so subtle on the Magellano 53 that it was initially difficult to tell when it was achieved, but for quick weekend island hops, planing at 18 knots would get you anywhere in a hurry. LOA 55 ft., 5 in. Beam 15 ft., 5 in. Draft 4 ft., 9 in. Twin Cummins QSC8.3L 500 hp engines, 3.5 kw genset, Quick1500 electric windlass, twin aft windlass/winches for a tie-up, hydraulic swim platform, bow thruster, galley appliances, electric heads and more. 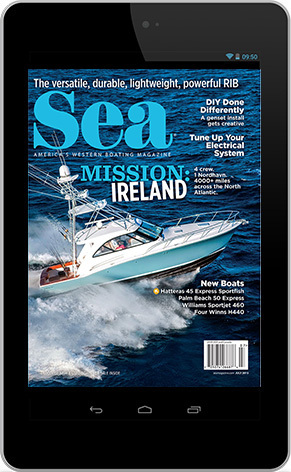 Seakeeper gyro stabilizer, crew quarters w/additional head and air conditioning, double Racor stern thrusters, Xenta joystick, 20 kw Kohler genset, Raymarine eSeries navigation electronics and more. This entry was posted in Boat Tests and tagged motoryacht, yacht test, yacht review, luxury yacht, Azimut, Azimut Magellano by bsheehy. Bookmark the permalink.